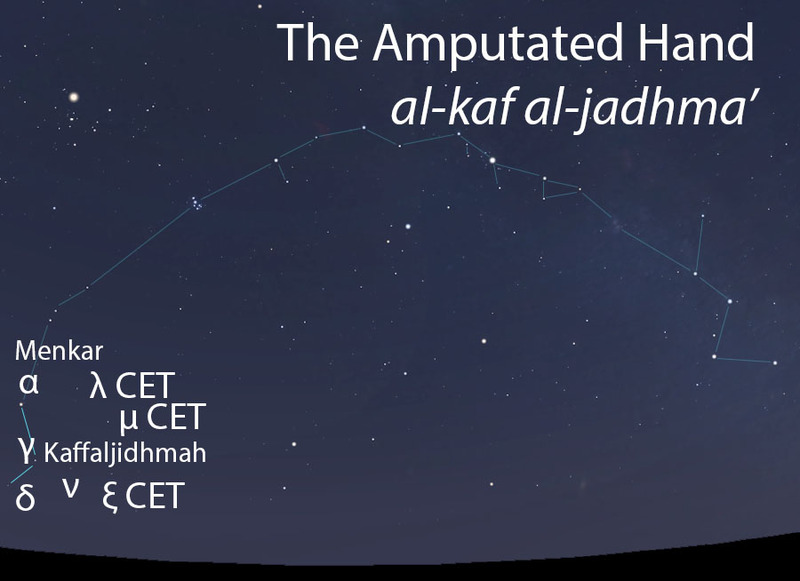 The Amputated Hand is one of two hands of Thuraya, a brilliant star cluster that was anthropomorphized as a female figure. The Amputated Hand is shorter than the Henna-Dyed Hand (al-kaf al-khadib) and also lacks the well-defined elements of the latter. The Arabic term jadhma’ may also indicate that this hand was amputated because it was leprous. 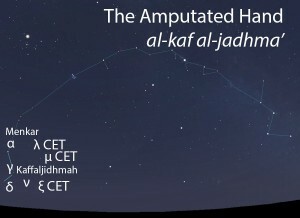 The Amputated Hand (al-kaf al-jadhma’) as it appears in the west about 45 minutes before sunrise in early November. Sky simulations made with Stellarium. A scattered group of stars located south of the Signs (ash-sharatan). The Amputated Hand almost certainly included Menkar and Kaffaljidhmah (see below), but likely also included other nearby stars of modern-day eastern Cetus. The Amputated Hand does not figure among the rain stars. The Amputated Hand is not one of the lunar stations. The Amputated Hand is part of the Hands of Thuraya (aydi ath-thuraya, أيدي الثريا) folkloric celestial complex. The Amputated Hand connects through Thuraya itself (ath-thuraya, الثريا) to the Henna-Dyed Hand (al-kaf al-khadib, الكف الخضيب).